The p38α, also named Mapk14, is a pro-apoptotic protein, which is reported to be downregulated 2 h after cerebral ischemia. However, little is known what causes the downregulation of p38α protein level. 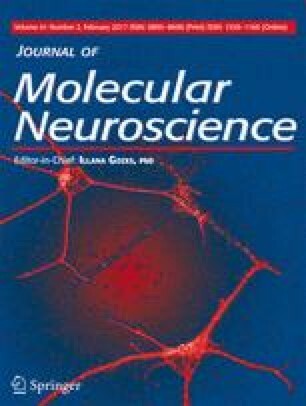 Here, we studied the effect of cerebral ischemia on p38α mRNA expression and p38α protein level in brain of mice. We found that p38α protein level is reduced after middle cerebral artery occlusion. However, at the meantime, p38α mRNA expression has no detectable changes, suggesting that the possible posttranscription is regulated by ischemia. To reveal the mechanism for posttranscription of p38α protein, we tested the effect of miR-128-3p. Using luciferase reporter assay, we found that miR-128-3p could directly target p38α 3’UTR. We further tested the effect of miR-128-3p on the p38α protein level. We found that miR-128-3p strongly decreased the p38α protein level in SH-SY5Y cells after the cells were transfected with miR-128-3p using lentivirus vector containing precursor its RNA sequences. We further found that inhibition of miR-128-3p enhanced the infarct volume of brain in mice. Our study thus confirms that miR-128-3p can downregulate p38α protein level through posttranscription and increase of miR-128-3p level may contribute to neuronal survival in ischemia-induced brain injury. We thank Xiaobing Zhang for helpful suggestions on the manuscript. Support is provided by the Shaanxi Science and Technology Research and Development Program (2012-KCT-16). GCM and GW performed statistical analysis, data interpretation and manuscript preparation. YLZ contributed to study concept, design and supervision. PYR and FY performed literature research and data extraction. YLZ and GW were responsible for quality control of data and accuracy. All authors wrote the manuscript and approved the final version of the paper.